“The last few years, while writing my poetry, I’ve been concerned about not deviating from Catholic orthodoxy, although I’m not sure how it came out in the end,” says the author of The Land of Ulro in a letter to the pope (my own revised translation). Granted, Milosz was much more of a believer than we tend to give him credit. There is even a fairly badly translated series of letters exchanged between Milosz and JP2 available online here. One Goodreads commenter said The Stained Glass Elegies are “sad stuff” and added a frowning smiley. But so is much of history and, not infrequently, so is daily life. But what does God have to do with that? August 9th was also the 68th anniversary of the Nagasaki bombing. 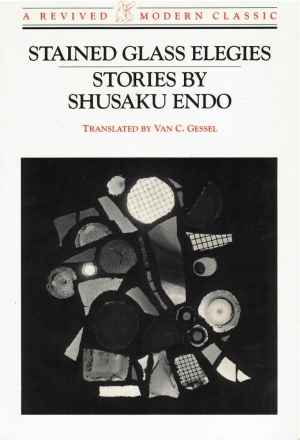 All of these convergences somehow reminded me of two short stories penned by the postwar Japanese-Catholic writer Shusaku Endo in the collection Stained Glass Elegies. The first one features the strange encounter between a child and Kolbe during his mission to Japan. Later on, as an adult, the person shocked at the news of that someone so cowardly looking (like a mouse) found the courage to give up his life for another. The other story involves a rich Japanese tourist visiting a Polish prostitute a severely economically depressed period in Poland and having an epiphany upon seeing a picture of Kolbe hanging on the wall (if I’m not mistaken) while waiting for her to undress. 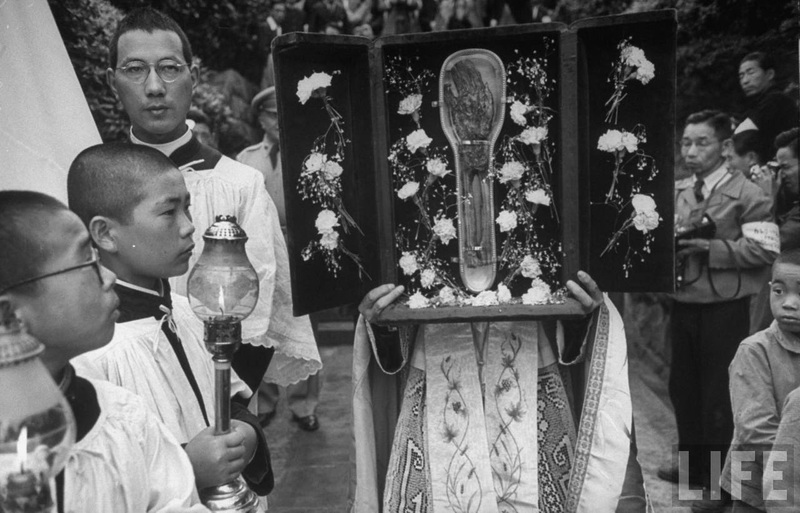 “…As I study the [picture of the relic, see below], I wonder what the appearance of this relic might have meant in an immediate postwar context. In 1949, the atom bomb’s effects on Nagasaki were still very visible: another of Mydans’ photos reminds us that the Pontifical Mass celebrated to mark four centuries of Christian faith in Japan took place within the ruins of a destroyed Catholic cathedral. Considering the relic itself, it strikes me that it is difficult to look at the shriveled fingers of the saint’s hand and the exposed bones of his forearm without thinking of the disfigured flesh of the atom bomb’s victims. Would the Catholics of Nagasaki have seen a link between Xavier’s body and the bodies of their kin? I can’t know for sure, but I also can’t help but wonder whether they might have done so. I’m still not quite sure what to make of all these connections, but I’ll add another one: Despite the Youtube description, below you will find an excerpt from the excellent Krzysztof Zanussi film about Kolbe, “Life for a Life.” You can find copies of this film scattered throughout the States. Unfortunately, only a few of Zanussi’s films are available in the States. I’d recommend “A Year of the Quiet Sun,” which features stunning (nearly silent) performances by Scott Wilson and Maja Komorowska. It is set in the devastation of postwar Poland. UPDATE: The whole film is available in Polish (with much German) on YouTube. The acting is good enough that you could watch it without knowing either one of those languages.